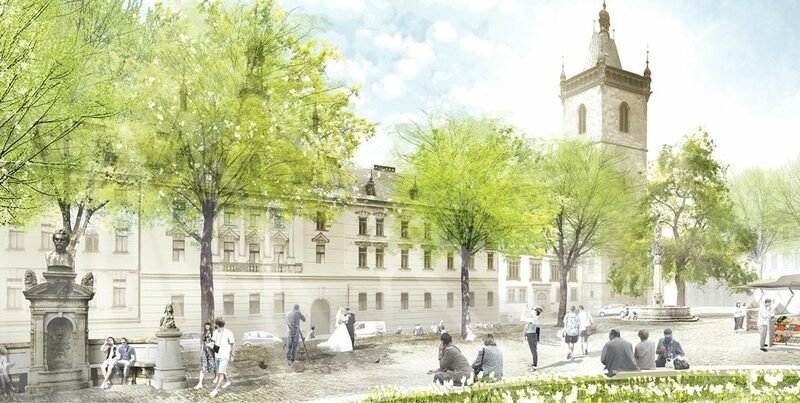 In the previous issue of REVITALIZATION, we had an article revealing that the walkable revitalization of historic Victory Square in Prague, Czech Republic would soon be getting underway. The article revealed the new design, which had just been chosen. Charles Square as it looks today. Photo courtesy of City of Prague. Now, local leaders have informed us that they’ve selected a design for restoring 700-year-old Charles Square, another important nexus of the city. In recent decades, Prague has risen to become Europe’s 5th most popular city for tourists, but these announcements make it clear they are not resting on their laurels. After many of years of unsuccessful attempts, Prague finally knows what the revitalized Charles Square will look like. The winning design—from German landscape architect Rehwaldt Landschaftsarchitekten and two Czech design studios BY Architects and PD Filip—was approved by Prague City Hall on November 13, 2018. 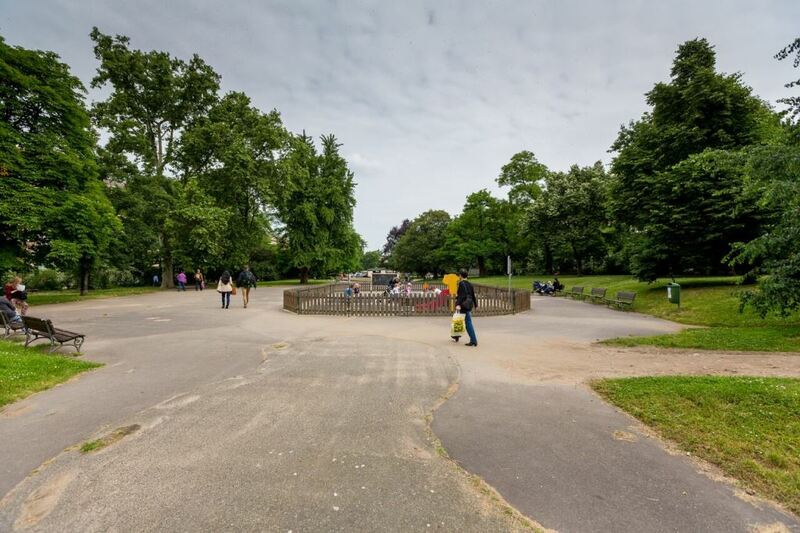 The sensitive restoration of the park in the city center will include a promenade, café, playground and market. The revitalization aims at making the park a place where people want to spend time. “I dare say that the entire process was quite enriching and instructive for all of us. It was challenging at times to find common ground, and to discuss and pass on feedback to the teams that kept coming up with innovative ideas. All the teams did a professional job throughout the consultation process and the final proposals were of very high quality, so there were plenty to choose from. Picking a winner was really very difficult,” said Mayor Adriana Krnáčová about the design selection process. 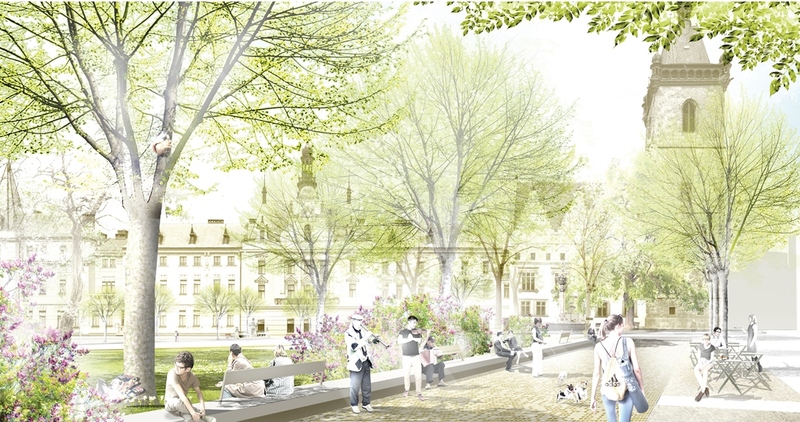 The winning team proposes dividing the transformation of Charles Square into three stages. The square will change gradually, beginning with minor work that can be done quickly, and eventually undergoing fundamental changes to attain long-term objectives. To save dying trees, some of the landscaping will begin next year. Once the design documentation is processed, the general revitalization of the park should begin in 2025. 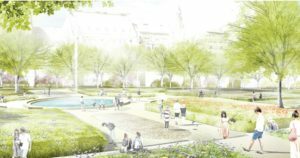 The long-term vision up to 2048 (the 700th anniversary of the founding of Charles Square) calls for gradually reducing traffic through the square to such degree that the entire east side will become a promenade dedicated for pedestrians. The transformation of the park also involves a new layout of walkways. This will enable easy passage in the directions most used, especially from the Metro to the hospital, and will also not restrict the use of extensive grassy areas for relaxation. A new café will appear in the south part of the square, along with a playground. In the central area will be space for community management of flower beds. The space will assume a more distinguished appearance with new furnishings, Prague mosaic paving that will even encompass QR codes with links to the history of the square, and the replanting of missing or dying trees. The part of the park by the New Town Hall will undergo complete reconstruction to make it a suitable space for social events and markets. “I am pleased that the winning design honors the historical legacy of the park from its founding by Charles IV. up to the landscaping of František Thomayer, while also introducing some timeless solutions for its problems. 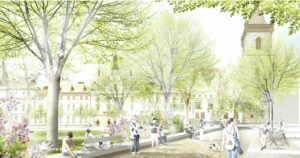 It is important to realize that choosing a design is just the beginning, and that the road to the complete revitalization of Charles Square will require the same commitment and collaboration of all those involved in creating the design, including the city, conservationists and local stakeholders,” explains City Councilor Jana Plamínková. An interesting element of the design is also the demarcation of Corpus Christi Chapel, which originally stood in the center of the square where Ječná Street runs today. The designers will bring attention to this history with a light installation marking the path along which pilgrims walked to the chapel. There have been many attempts to revitalize Charles Square – for example, the architectural competition in 2008. So far, however, it hasn’t been possible to move the project further because individual institutions could never agree on what the square should be like in the future. It turned out that a different approach was needed. That is why the innovative approach of a competition with dialogue was employed, with Charles Square serving as the pilot project. This involves interactive cooperation of the city with architects aimed at establishing an ongoing consensus among all parties with regard to the design. Thanks to this manner of choosing a design it was possible to include all major stakeholders in the process, and they not only influenced the objectives, but continually also influenced the designs. The process thus closely involved experts from City Hall, representatives of Prague Districts 1 and 2, experts from the National Heritage Institute, representatives of the universities and hospitals residing on Charles Square, the owners of buildings on Charles Square, as well as the Police and Fire Department. The first stage of the transformation of Charles Square has actually been underway for some time. Revitalization of the park falls under stage II of the general transformation. Stage I involved repairs to the periphery of the square. In 2015 the tram lines, sidewalks and tram stops were reconstructed. Then the sewers and water lines dating from the mid-19th century were reconstructed, also in 2015. Technická správa komunikací (TSK) is responsible for the reconstruction of the remaining roads and crosswalks. engagement of the community to revitalize the park. new surfaces, furnishings and public amenities. The price tag for the complete revitalization of the park is estimated at roughly 230 million crowns (a little over 10 million USD). 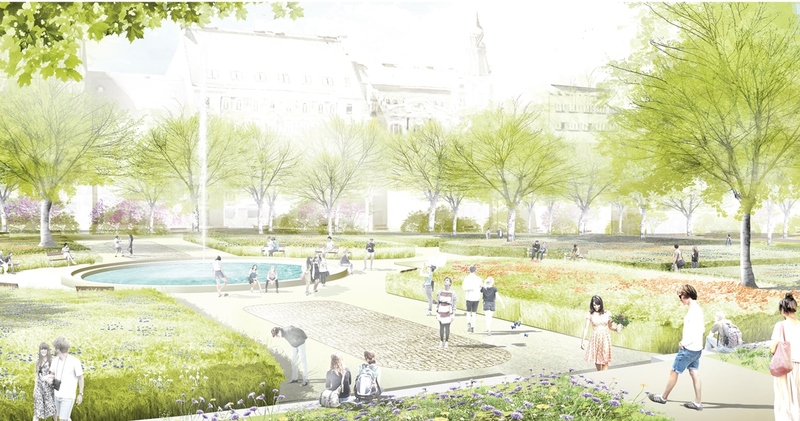 “Thanks to this design, Charles Square has a chance to be reborn as one of the most beautiful parks in the center of the city,” concludes Ondřej Boháč, Director of the Prague Institute of Planning and Development. All renderings courtesy of Rehwaldt Landschaftsarchitekten.